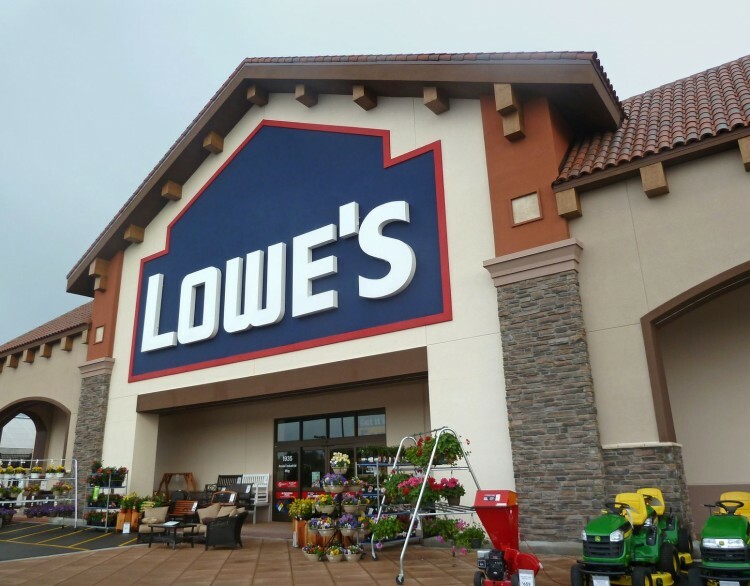 “Lowe’s Companies, Inc (“LOW”)Lowe’s was one of four new investments in 2018. Lowe’s is a high-quality business led by a new, high-caliber management team that has committed to meaningfully narrowing the performance gap with its direct competitor, Home Depot. We initiated our investment after the company announced a CEO search process. In May, Lowe’s announced that Marvin Ellison, a former senior executive at Home Depot, would become CEO. We believe that Marvin has the relevant experience, leadership qualities and skill-set to allow Lowe’s to achieve its potential. Since Marvin started in July, he has assembled a new leadership team of seasoned executives, many of whom previously worked with him at Home Depot. In December, management hosted an Analyst Day and outlined a credible plan to narrow the performance gap with Home Depot. Lowe’s strategy is centered around better execution of “retail fundamentals,” including enhanced merchandising, transforming its supply chain, achieving operational efficiencies, and better engaging with its customers. The new plan calls for Lowe’s to achieve a 12% operating margin over the medium-term compared with its current operating margin of 9.2%, and Home Depot’s operating margin of 14.6%. Achieving these targets will generate significant profit improvement which, when coupled with the company’s large and ongoing share repurchase program, will further accelerate future earnings per share growth. While Lowe’s has already demonstrated early signs of progress, we believe the positive impact of the company’s business transformation will become more pronounced over the course of 2019. Lowe’s currently trades at 17 times analyst estimates of 2019 earnings, a discount to Home Depot, even though these estimates do not incorporate the potential for future profit improvement. We believe that there is substantial upside potential as Lowe’s narrows the performance gap with Home Depot, which will significantly increase earnings, and likely result in a valuation that better reflects the company’s underlying business quality and long-term growth prospects. Lowe’s Companies is a home improvement company that offers a plethora of products for repair, decorating, and maintenance. It runs around 2,370 hardware/home improvement stores. This $86.02 billion market cap company is based in Mooresville, North Caroline, but offers its services across the US, Mexico, and Canada. Year-to-date, Lowe’s Companies’ share price is up by 16.39%, and on March 27th it had a closing price of $107.39. If we take a look at the stock price rate over a longer period, such as 12 months, for example, we can notice that the stock gained even more, or 25.04% exactly. The company is trading at a price-to-earnings ratio of 26.10. In its last financial report for the fourth quarter ended February 1st, 2019, Lowe’s Companies disclosed a net loss of $824 million and diluted loss per share of $1.03, which compares to net earnings of $554 million and diluted EPS of $0.67 for the corresponding period of 2017. It also reported adjusted diluted EPS of $0.80, up by 8.1% from $0.74 in Q4 2017. More recently, the company announced a quarterly cash dividend of $0.48 per share, payable on May 8th, 2019, to shareholders of record as of April 24, 2019. At Q4’s end, a total of 53 of the hedge funds tracked by Insider Monkey were bullish on this stock, a change of -7% from the previous quarter. 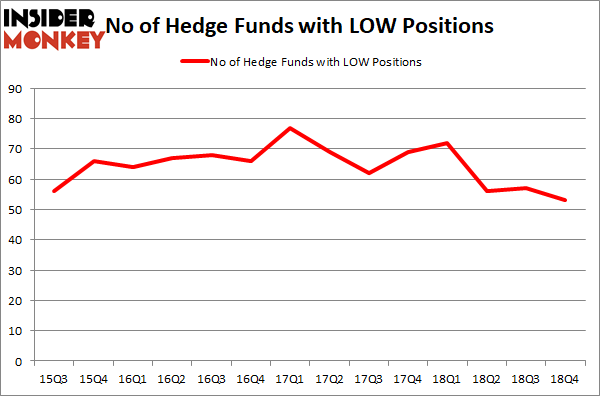 By comparison, 72 hedge funds held shares or bullish call options in LOW a year ago. With hedge funds’ positions undergoing their usual ebb and flow, there exists a few notable hedge fund managers who were boosting their stakes meaningfully (or already accumulated large positions). According to Insider Monkey’s hedge fund database, Pershing Square, actually holds the number one position in Lowe’s Companies, Inc. (NYSE:LOW). The fund has a $880.8 million position in the stock, comprising 14.8% of its 13F portfolio. Coming in second is D. E. Shaw of D E Shaw, with a $817.7 million position; 1.1% of its 13F portfolio is allocated to the company. Remaining hedge funds and institutional investors with similar optimism contain Cliff Asness’s AQR Capital Management, Israel Englander’s Millennium Management and Daniel S. Och’s OZ Management. On March 20, Evercore ISI initiated coverage on the stock and placed ‘Outperform’ rating with a price target of $120, while a day earlier Morgan Stanely set a price target of $115.00 with a ‘Buy’ rating on it. Were Hedge Funds Right About Dumping FedEx Corporation (FDX)? Were Hedge Funds Right About Selling Northrop Grumman Corporation (NOC)? Is Vertex Pharmaceuticals Incorporated (VRTX) A Good Stock To Buy? Is Illinois Tool Works Inc. (ITW) A Good Stock To Buy? Were Hedge Funds Right About Ecolab Inc. (ECL)? Were Hedge Funds Right About Getting Into Bank of Montreal (BMO)?